Context: I'm working as a regular user consuming my company's modern Sharepoint deployment, so my capabilities are pretty limited other than what's available from the GUI. 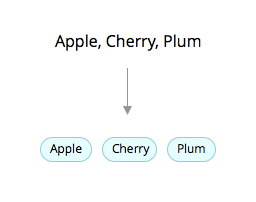 When SP outputs the field, it looks like this: "Apple,Cherry,Plum". I an add formatting before and after the text, but I can't separate the individual members. I've also tried to use a Calculated field to pull in the multi-selection Choice field and output a string I could then manipulate a little easier with field formulas, but apparently Calculated fields don't work with multi-selection Choice fields(?). Browse other questions tagged choice-field formatting multiple-values json-formatting or ask your own question.